The buffalo will love grazing not "Home On The Range" but rather "Home On the Railroad Layout"! 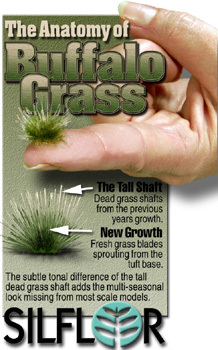 NEW Buffalo Grass Tufts will add natural, dried, seasonal multi-tone turf-grass tufts to the most arid looking areas of your layout. The tufts are mounted on an invisible base that causes the tufts to stand up and feather outward. Tufts may be placed (then glued) individually or peeled off in random clusters. Each package contains one 6" x 9" sheet of short (2mm-4mm) tall tufts and one 6" x 9" sheet of medium (4mm-6mm) tall tufts. There are over 300 tufts. SET INCLUDES BOTH 2mm/4mm (SHORT) AND 4mm/6mm (TALL) SIZE TUFTS!